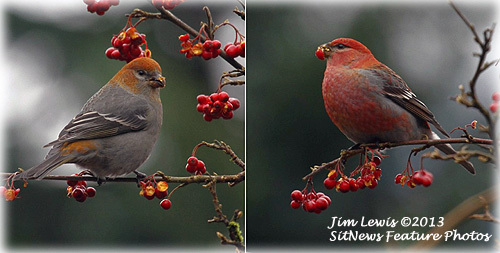 Pine Grosbeaks eating berries along the North Tongass Highway recently.The Pine Grosbeak on the left is a female and the one on the right is a male. They were singing as they ate the berries. Fish Factor: HALIBUT COMMISSION ANNOUNCES 2013 CATCH LIMITS AND SEASONS By LAINE WELCH - Halibut catches weren’t slashed as badly as people feared, although they still continue on a downward trend – and the outlook is grim. A coast wide catch of 31 million pounds was approved on Friday by the International Pacific Halibut Commission, a decline of 7.5 percent from last year, and far better than the 30% cut that was widely anticipated. Alaska’s share of the Pacific catch is 23 million pounds, down 2.5 million pounds across the board. The IPHC commissioners, three from the US and three from Canada, each said the 2013 annual meeting last week was the toughest one ever. Along with setting the catch limits and fishery dates (see below), the IPHC addressed several regulatory proposals, none of which were approved. A recommendation for less invasive circle hooks to be the only legal gear was tanked due to “regulatory difficulties.” Circle hooks do less damage to the fish as they are hauled aboard. “The commissioners are anxious at any possible time to reduce damage to fish and prevent needless mortality. So we are going to ask the IPHC staff to work on a public outreach mode, and to develop materials working with fishing groups to provide education on how circle hooks might be used more efficiently and more broadly through the industry. We have problems regulating it so we are going to focus on that for the time being,” said Commissioner Jim Balsiger, who also is director of NOAA Fisheries in Alaska. 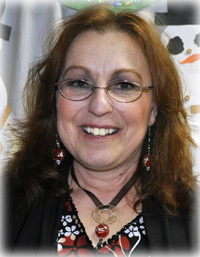 Ketchikan: ROSITA BUTLER AWARDED CHILD CARE CREDENTIAL - Rosita Butler of the PeaceHealth Ketchikan Medical Center Child Development Center has been awarded a Child Development Associate (CDA) credential in recognition of outstanding work with children. The Council for Professional Recognition in Washington D.C. awards credentials to early childhood educators who demonstrate the ability to constructively work with young children in group settings. Southeast Alaska: Valdez Couple Sentenced For Long Running Tax Evasion Scheme - U.S. Attorney Karen L. Loeffler announced that Gary and Marladeen Jokela of Valdez, Alaska, were sentenced for willfully evading Gary Jokela’s tax liabilities for more than a decade. U.S. District Court Judge H. Russel Holland sentenced Gary Jokela to one year in federal prison. Marladeen Jokela was sentenced to six months in federal prison, followed by six months of home confinement. According to court filings, the Jokelas last filed a tax return in 1984. Meanwhile, Gary Jokela had outstanding tax liabilities that had not been paid since at least 1998. The Internal Revenue Service previously assessed taxes against Mr. Jokela and sent him numerous notices that the Service intended to levy his wages and bank accounts. When the Jokelas received these notices, both Gary and Marladeen began cashing Gary’s paychecks rather than depositing them to their joint bank account. In total, Gary cashed more than $170,000 of his paychecks. Ketchikan: 2013 Sam Pitcher Scholarship Recipients Selected - Four Ketchikan students have been selected to receive 2013 Sam Pitcher Music Scholarships. The students are 11th grader Jillianne Fazakerkey, daughter of Glen and Elisabeth Fazakerley, 10th grader Hana Lee Oshima, granddaughter of Steve and Grace Kinney, 9th grader Kaileigh Krosse, daughter of John and Patricia Krosse, and 9th grader Lora Starr daughter of Charley and Cindy Starr. The scholarships are for $500 each awarded on the basis of merit, goals and musicianship. Jillianne plans to attend Interlochen Arts Camp in Michigan, and the other three recipients plan to attend the Sitka Fine Arts Camp. Jillianne Fazakerley, and Hana Lee Oshima. Jillianne Fazakerley plays piano, trumpet and trombone. She has been selected for Southeast Honor Band and All Alaska Jazz Band. Jillianne would like to be a worship leader and continue playing, sharing and teaching music with as many people as possible. Hana Lee Oshima has studied classical piano, and alto saxophone in both Ketchikan and Kanayama, Japan. She was recently selected for Southeast Honor band. She hopes to continue to be involved with music in some way throughout her life. Kayleigh Krosse plays piano and violin. She previously received a scholarship to attend Cornish University Summer Orchestra in Seattle, WA, and played first violin in the orchestra for Ketchikan’s fall musical. She plans to pursue musical studies in college.